Anna Durand is an award-winning author of sizzling romances, including the #1 bestseller Scandalous in a Kilt, a bronze-meadl winner in the 2018 Readers' Favorite Book Awards. The Psychic Crossroads series came about after she read an article about a supposedly real government project that explored the possibility of psychic espionage. Kinetic: Psychic Crossroads, Book 3 is a paranormal romance novel written by Anna Durand. Sean Vandenbrook’s first meeting out-of-doors in several months was faltering along with quite a bit of concern emanating from David Ranson, his mentor, friend and sometime surrogate father. David and Grace were like family to him, and Abby, their young daughter, considered Sean her uncle. He had finally agreed to meet with David after their repeated attempts to communicate with him, and even now he was remaining frustratingly uncommunicative from David’s perspective. Sean was still having trouble controlling his abilities, particularly his empathic skills, to which he felt the world definitely did not need exposure. Yes, he owed Grace his sanity and more, and he loved her and her husband, but he needed space to heal. Sean and David’s luncheon date was abruptly interrupted when Sean noticed a young woman standing by the cafe’s doorway. He could feel her stress and air of desperation. As he watched, she moved her fingers, drew them up into her palm and stretched them out straight. Instantly, the building housing the cafe was demolished, and David was lying unconscious under bricks and other debris. 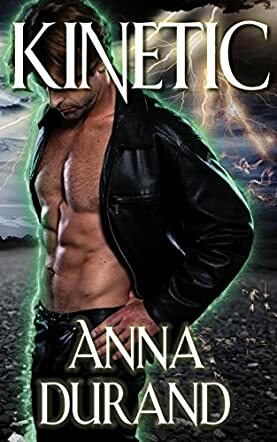 Anna Durand’s paranormal romance novel, Kinetic, is the third book in her Psychic Crossroads series, but the author gives enough background information in the story for it to be enjoyed as a standalone novel. The plot’s explosive beginning propels the reader into a tense and action-packed tale about an unseen danger that could spell an end to humanity. Durand’s characters are vividly portrayed, and their paranormal abilities are wondrously explored and charted throughout this suspenseful dark fantasy. Sean Vandenbrook and Kira Magnusson are marvelous characters, and watching as they try to rescue her brother and foil the madman behind his kidnapping is grand fun indeed. While there are some moderately steamy parts to this book, they are tastefully and beautifully written and are eloquent expressions of the characters’ growing love and affection for each other. Kinetic: Psychic Crossroads, Book 3 is most highly recommended.